Beer bottles being put to good use by decorating them with M-seal and giving them an underwater appearance. 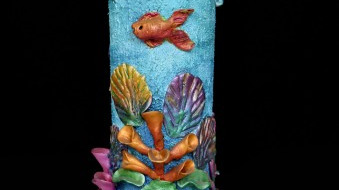 Various shapes and forms created with M-seal , like fishes,octopus,corals, will be put together on the bottle for it to come into view as an aquatic storyline. Date- 6th & 7th April 2019 From- 1:00 P.M. To- 5:00 P.M.
Share "Knick-Knack a Beer Bottle"